Here at Costume Holiday House we are in the middle of Prom season and Wedding season is just beginning! We always get asked “What’s popular?” or “What do you think would look best?”, so here is our guide to picking the right tuxedo for your event. The Lapels â€” The most formal style of lapel is peaked, but a shawl collar is equally acceptable.Â Notch lapels are worn today, but are considered less formal. In all cases, the left lapel should have a working buttonhole so that a boutonniÃ¨re may be worn. A distinguishing factor between a tuxedo jacket and a suit jacket is that tuxedo jackets have a satin or silk facing on the lapels. 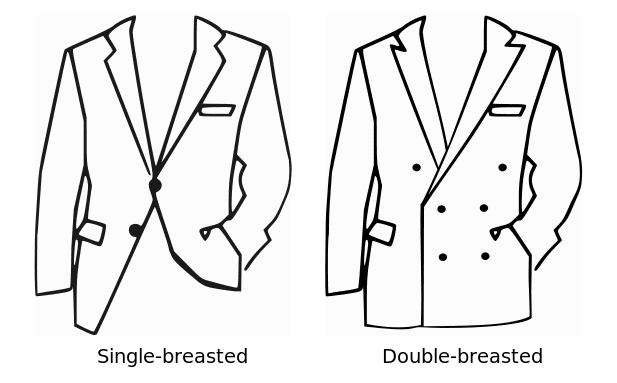 The Buttons â€” Most tuxedo jackets are single-breasted, with a single button, but double-breasted models are also acceptable. They have between 1 and 4 buttons. Although technically not “tuxedo” jackets, we also offer tailcoats, cutaway coats and long jackets. Formal tuxedo trousers feature a black satin stripe or braid along the outside seams. The trousers need to be high-waisted, so that the vest or cummerbund can fully cover the waist. Because they don’t feature belt loops, tuxedo trousers have adjustable tabs on either side to adjust fit. You may also wear suspenders. They do not have cuffs and pleats are optional. Tuxedo shirts are traditionally white, but can also be black. You have your choice of three collars styles: wingtip collar, laydown and mandarin. 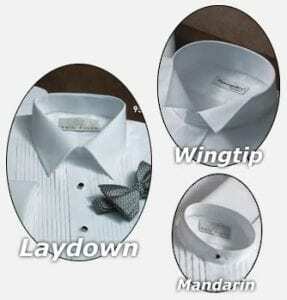 Wing collar shirts have a pleated bib that runs down the front of the shirt. Turndown collar shirts are available with the pleated bib or with a, less formal, flat front. Mandarin collar shirts are considered by many to be old fashioned. They come with a pleated front and are worn without a tie. 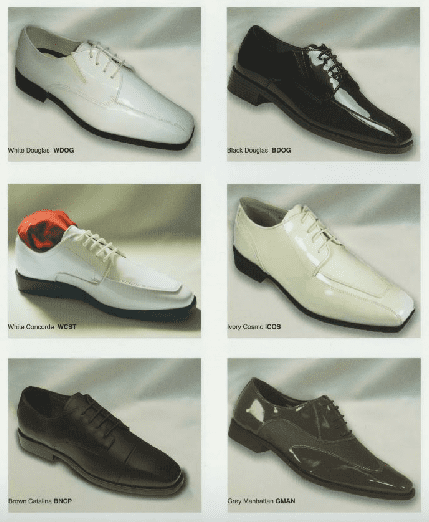 Formal shoes are made from highly-polished patent leather. Choose between opera pumps (the most formal option) or oxfords. Most shops also offer spectator-style and matte leather shoes. Thin black socks should be worn with whatever style of shoe you choose. 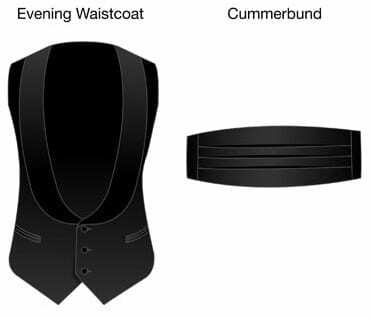 A tuxedo is worn with a waistcoat (formal vest) or cummerbund. A cummerbund is a pleated sash worn around the waist. A waistcoat is a particular style of vest that is cut low and wide. Waist coverings are offered in a wide variety of colors. Whichever waist covering you choose, it should conceal the waistband of your trousers all the way around. 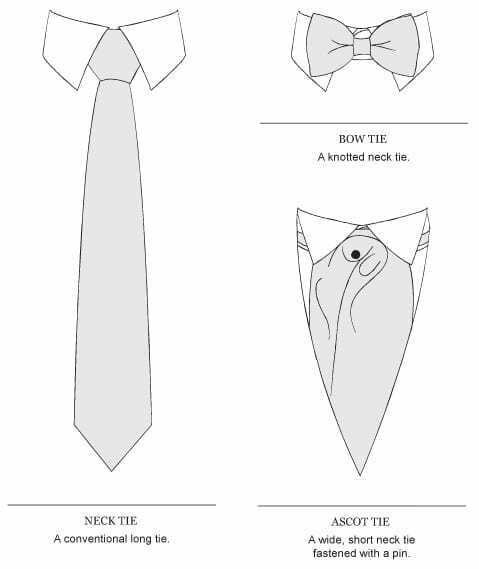 The Tieâ€“ A traditional tuxedo is worn with a bowtie, but a neck tie is also acceptable for many events. Ascots are also available, and are typically worn with the cutaway jackets. The Suspenders â€“ These button or clip-on to the trouser waistÂ Black or white are equally acceptable. The Pocket Square â€“ Pocket squares are usually added to break up the otherwise uniform look of a tuxedo. They should match your waist covering and bowtie. 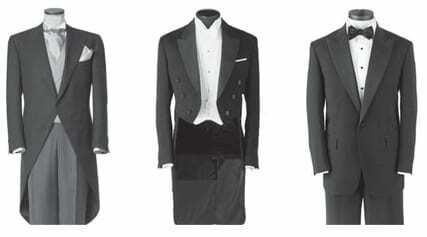 A traditional tuxedo is black or dark blue, but they are also available in other colors, such as white, tan or gray. The highest formal dress for the evening follows the â€œwhite tieâ€ dress code. It is a very strict dress code, which makes it very easy to plan and follow. Jacket â€“ Black or midnight blue tailcoat with peaked lapels and a single button. Can be single-breasted or double-breasted. Trousers â€“ Fabric matching the jacket with two strips of braid down the side. Shirt â€“ White stiff wing collar, with pleated bib front. Matching studs and cufflinks. Shoes â€“ Black patent leather opera pumps or Oxfords. Waist Covering â€“ White low-cut waistcoat. In dress code terms, black tie is evening semi-formal attire. If an event is “black tie” it will usually be included in the invitation, and it is also a very strict style. Jacket â€“ Black or midnight blue tuxedo jacket with peaked lapel or shawl collar. Trousers â€“ Fabric matching the jacket with a satin strip down the side. Shirt â€“ Turndown collar is most common but wing collar is also acceptable. Pleated bib front. Matching studes and cufflinks. Button-down collars should never be seen in black tie. Tuxedoes for relaxed semi-formal events are what we rent the most. They’re often events in which you must match someone, or where there is a color theme. You have much more freedom with these than with “black tie” and “white tie” events. 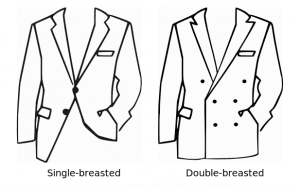 Jacket â€“ Tuxedo jacket with peaked lapel, notched lapel or shawl collar. Any color is acceptable. Single-breasted or double-breasted. 1 to 4 buttons. 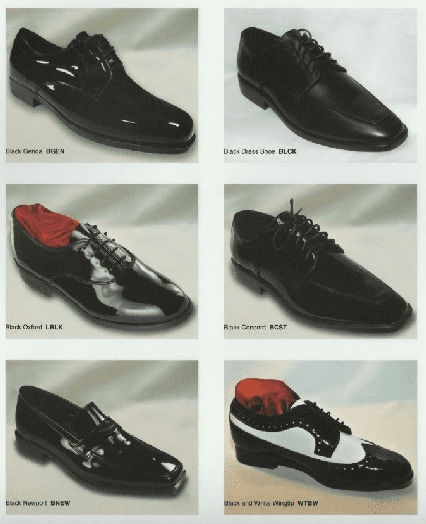 Shoes â€“ Patent leather opera pumps or Oxfords to match tuxedo color. Waist Covering â€“ Cummerbund or waistcoat. Typically, you should choose colors to match your date or the theme of the event. We hope that you have found this guide helpful! If you have any questions about our tuxedos, please call us at 419-334-3236.